A Life Insurance policy protects your family from the strain of final expenses. Term Life Insurance generally provides protection for a set period of time, while permanent insurance, such as Whole and Universal Life Insurance, provides lifetime coverage. 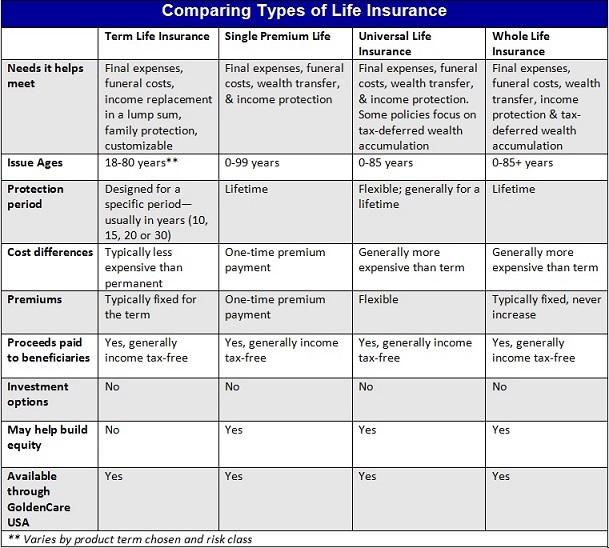 Death benefits from all types of Life Insurance are generally income tax-free. Pay final expenses, such as funeral costs, credit-card debt and taxes. Replace income your family would need to maintain their standard of living. Pay off your mortgage loan or other personal and business debts. If you rent your home, it can create a fund for future rent payment. Create an education fund for your children. Create a family emergency fund. Protect future insurability – no matter what your future health, your policy will stay in force as long as premiums are paid. Build cash values on a tax-favored basis – in permanent life insurance plans. When the policy is properly funded, these cash values can be borrowed through policy loans. Final Expense Life insurance helps take care of your final expenses (i.e. funeral, cremation, casket, cemetery etc. ), as well as outstanding medical bills or debts. Any excess funds are paid to the policy’s beneficiary. 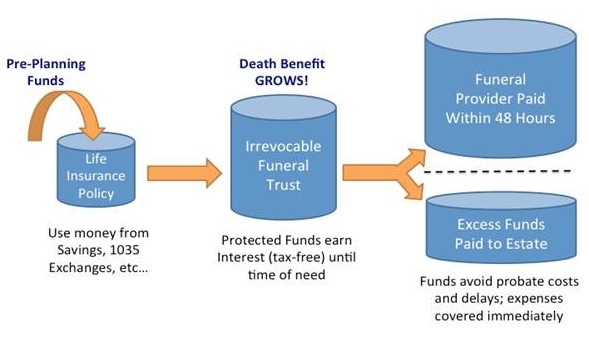 Why choose Final Expense Life Insurance rather than a pre-paid funeral through a funeral home? What if you move, making your pre-paid funeral in a certain locality impractical? Single Premium Life provides lifetime protection and requires only one premium payment paid up-front to guarantee payment to beneficiaries. Since this large, up-front payment begins accumulating cash value immediately, the policyholder will earn more than holders of policies paid in installments. Under the tax reform act of 1986, the premium appreciates tax-free. Universal Life insurance is flexible-premium, adjustable-benefit, permanent life insurance that can accumulate values beyond the guaranteed cash value. In addition to its cash values, which can be used for children’s educations, to supplement retirement income and for incidental expenses, universal life insurance is flexible enough to change as your needs change. Whole life insurance policies provide coverage until your death, and also feature a cash value component. The policy builds cash value the longer it is in effect – in turn, that cash value may be borrowed against and used for various expenditures throughout your life. A combination of life insurance and a funeral trust creates a secure plan to cover your final expenses. A life insurance policy purchased to cover the anticipated costs of your funeral is assigned to an Irrevocable Burial/Funeral Expense Trust. Gibbs,L., Mangla, I., The High Cost of Saying Goodbye. (2012, November 9) CNN Money.com, http://money.cnn.com/2012/11/01/pf/funeral-costs.moneymag/4.html?iid=EL, Accessed: April, 24, 2013. Kavilanz, Parija. Funeral Cost-Cutting Boosts Cremations. (2009, April 9) CNN Money.com. Accessed: April 8, 2013.